This summer, we happily traded in our summer intern cubicles, laptops and professional attire for kayaks, clam rakes and bathing suits for a trip to Barnegat Bay. We headed to Sedge Island, off of Island Beach State Park, and kicked off the day with a boat ride to the island. There, we joined fifth grade “Species on the Edge” art and essay contest winners, their parents, and state wildlife biologists with their seasoned interns. Conserve Wildlife Foundation today released a video featuring the range of nature programs available at Sedge Island Marine Conservation Zone and Island Beach State Park, from kayaking and fishing to birdwatching and diamondback terrapin releases. Edited by CWF videography intern Melinda Tibbitts and written by Executive Director David Wheeler, “Get Wild This Summer at the Jersey Shore” explores these unique ecosystems along the Barnegat Bay – with a special focus on the Sedge Islands Celebration Day earlier this summer! Learn more about Sedge Island activities by clicking here. Consider signing up for near-daily programs at Island Beach State Park by visiting here. Bandit in flight while carrying nesting material. He has been nesting at the Pete McLain Osprey Cam nest since 2013. photo by Karl Soehnlein. On a cool and cloudy Monday morning, CWF Habitat Program Manager, Ben Wurst was joined by News 12 New Jersey reporter, Tony Caputo to highlight the osprey’s triumphant recovery in the Garden State. Ben was working in the field to repair a few osprey nests and complete the first of several nest checks at a nearby peregrine falcon nest. We work tirelessly to ensure that when ospreys return from their wintering areas that their nesting platform are in good condition. Ospreys have recovered from around 50 nests in the early 1970s to a record 668 nests documented in 2017. Click on the screenshot above or here to watch online. 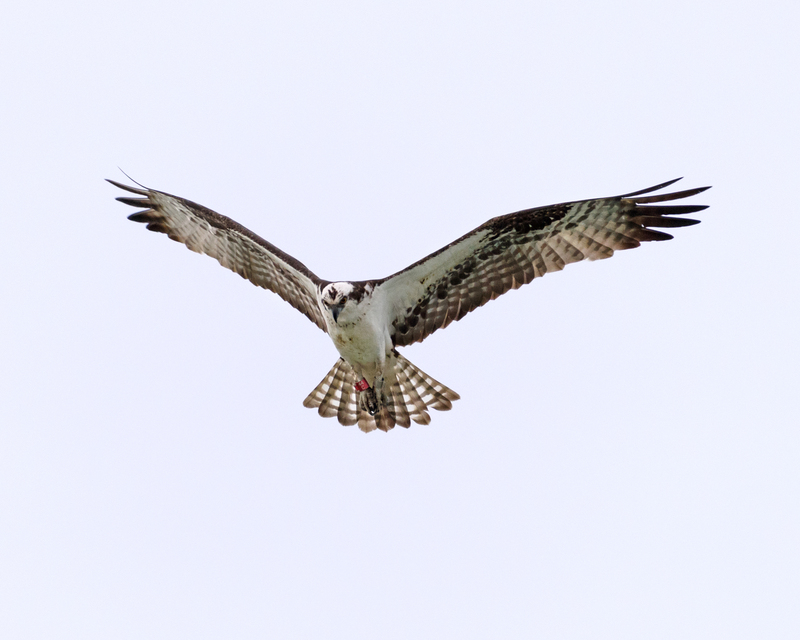 Osprey 44/C re-sighted at Island Beach State Park! Project RedBand Osprey 44/C was re-sighted by Shayna Marchese on Island Beach State Park on July 3, 2016.